Gary Stewart was appointed by the City Council to Place 5 in December, 2012. 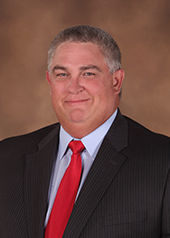 Mr. Stewart graduated from Scottsboro High School in 1982 and attended Northeast Alabama Community College, Jacksonville State University and graduated from Faulkner University of Montgomery Alabama with a Bachelor’s degree in Business Administration. He is presently a Shift Production Supervisor at RockTenn in Stevenson, Alabama. Mr. Stewart is the son of the late Garland and Louise Stewart. He is married to the former Patricia Cobb of Scottsboro. Patricia is a self-employed attorney. They have three children, Nina age 16, Emma age 13 and Thomas age 7. He is a member of the First United Methodist Church of Scottsboro. Mr. Stewart is the past Chairman of the Board of Trustees at the First United Methodist Church. He has also been active as a coach and assistant coach for various sports at the Recreation Department in Scottsboro.